The chairman of the Nasarawa State University chapter of the Academic Staff Union of Universities (ASUU), Dr. Theophilus Daniel Lagi has said that the union was not able to reach agreement with the Governing Council of the university, because none of the parties was willing to shift grounds on the issues that led to the strike action. The meeting which was second in series since the strike action commenced was in effort to reach amicable resolution with the authorities concern. NSUK CampusWatch correspondents who were on ground while the meeting lasted, gathered that, the university authority was not willing to compromise its position, especially on the issues of Earn Academic Allowance (EAA) and the funding of the institution, which forced both parties to end talk without meaningful understanding. 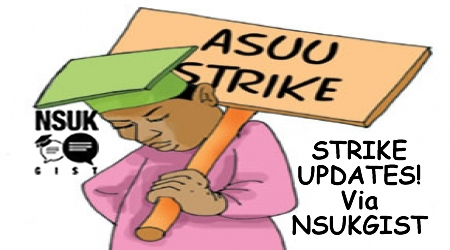 A senior staff of the university told NSUK CampusWatch that, ASUU and the governing council members ended in the meeting in a near argument like-situation, which provoked ASUU to call off the seating for later date yet to be decided. He allegedly blamed the failure to reach a compromise at the meeting on the attitude of members of the governing council, which he noted was not good for the progress and development of the institution. Meanwhile, the leadership of the ASUU has proposed Wednesday 16, 2016 for it congress meeting to brief its members on the outcome of the meeting with the visitor of the university and Governor of the State, Umaru Tanko Almakura and Governor Council of the university. Addressing newsmen shortly after the over three hours meeting with members of the council in Keffi, Dr. Lagi called on his members to continue to stay at home until all their demand are met. He added that, they have not reached a definite agreement on how to resolve these issues, and urged members of the union to keep faith on the struggle. Said he: “we have deliberated and looked on the issues in its own merit individually and holistically, but we have not been able to reach any meaningful concession on how this issues can be addressed. Fundamentally as regard to the issues of funding and the EAA”. Dr. Lagi therefore advised that before subsequent meeting, the council should meet the proper authority to find ways and means of resolving the contending issues. Mamman said that the council had made its position known to ASUU on its direction and effort made thus far to end the impasse. The registrar acknowledged that, “the only area that was difficult to reach agreement was the EAA and funding, because all the issues need money and so, we intend to meet again". He gave a figure of about three hundred million as the total sum in contention, and hope within the shortest possible time, they would call off the strike. Mamman observed that, if nothing was done urgently, the strike action would be a set back to the academic calendar of the university.